Quarkonia are bound states of heavy flavour quarks (charm or bottom) and their antiquarks. The first ALICE results for charm hadrons indicate strong in-medium energy loss for charm and strange quarks that is an indication of the formation of the hot medium of QGP. Two types of quarkonia have been extensively studied: charmonia, which consist of a charm quark and an anti-charm, and bottomonia made of a bottom and an anti-bottom quark.Charm and anticharm quarks in the presence of the Quark Gluon Plasma, in which there are many free colour charges, are not able to see each other any more and therefore they cannot form bound states. The "melting" of quarkonia into the QGP manifests itself in the suppression of the quarkonium yields compared to the production without the presence of the QGP. The search for quarkonia suppression as a QGP signature started 25 years ago. 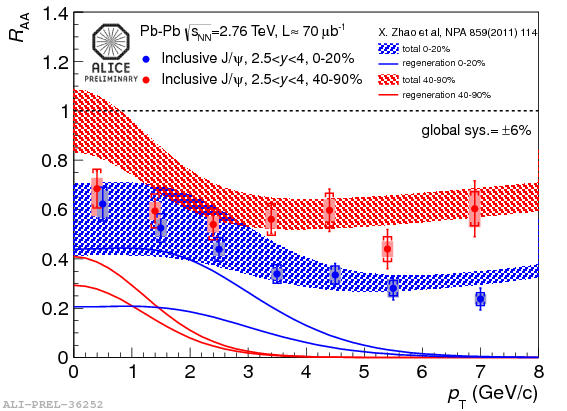 The first ALICE results for charm hadrons in PbPb collisions at a centre-of-mass energy √sNN = 2.76 TeV indicate strong in-medium energy loss for charm and strange quarks that is an indication of the formation of the hot medium of QGP. As the temperature increases so does the colour screening resulting in greater suppression of the quarkonium states as it is more difficult for charm – anticharm or bottom – antibottom to form new bound states. At very high temperatures no quarkonium states are expected to survive; they melt in the QGP. Quarkonium sequential suppression is therefore considered as a QGP thermometer, as states with different masses have different sizes and are expected to be screened and dissociated at different temperatures. However - as the collision energy increases - so does the number of charm-anticharm quarks that can form bound states, and a balancing mechanism of recombination of quarkonia may appear as we move to higher energies. The suppression of charmonium states was also observed in proton-lead collisions at the LHC, in which Quark Gluon Plasma is not formed. This suggests that the observed suppression in proton-nucleus collisions (pA) is due to cold nuclear matter effects. Grasping the wealth of experimental results requires understanding the medium modification of quarkonia and disentangling hot and cold-matter effects. Today there is a large amount of data available from RHIC and LHC on charmonium and bottomonium suppression and ALICE tries to distinguish between effects due to the formation of the QGP and those from cold nuclear matter effects.